EBCO is delighted to be able to announce the reduction of pricing for its stunning ebikes, UCR-30 and UCL-30, to only £999. This is a significant new price as it now enables these brilliant ebikes to be purchased throught the government cycle to work scheme. More information can be found here, so, if you haven’t already signed up to the scheme, speak to your employer and find out how you could save up to 40% off the retail price of one of our stunning EBCO UC 30 ebikes. A superb way to get to work! EXPRESS READERS GIVEN ANOTHER CHANCE TO WIN! Readers of the Daily and Sunday Express were so keen to win stunning EBCO Eagle LSR-50 that the paper has run another competition featuring it over six days in both the daily and weekend editions. 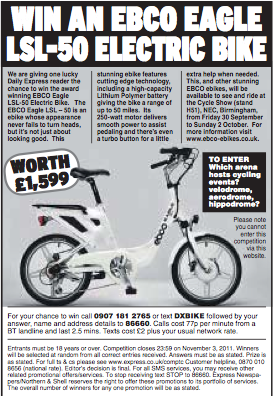 Almost unprecedented competition coverage, it just goes to show just how popular our EBCO ebikes are. Keep an eye on the website for further opportunities to win ebikes and even more press reviews! Jill Free from Girton, Cambridgeshire is the lucky winner of an EBCO Eagle LSL-50. 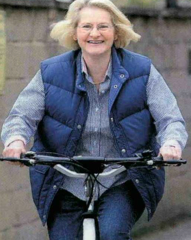 Pictured here with the EBCO-Grin as she discovers the joys of riding one of our stunning ebikes! Another happy EBCO ebike rider! You are currently browsing the EBCO Electric Bikes blog archives for October, 2011.